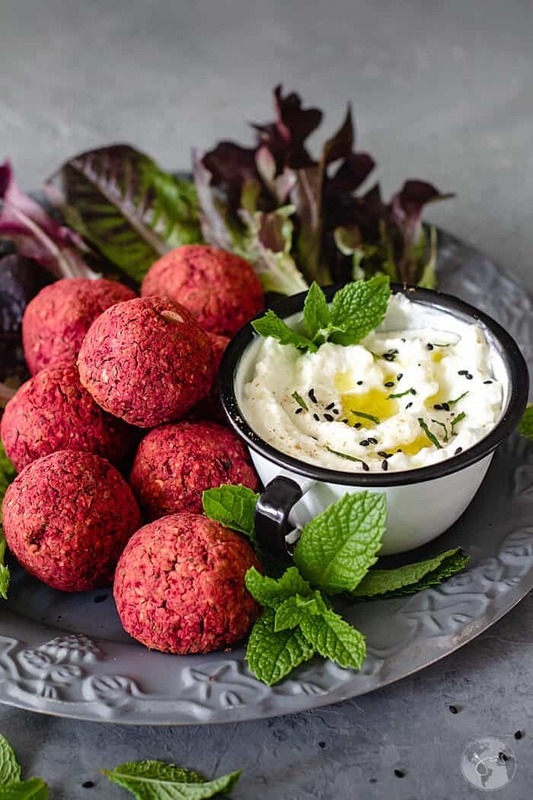 If you need an eye-catching appetizer for your next dinner or game-day party, then this recipe for baked red beet falafel is for you. Falafel is an amazing food for so many reasons, aside from it being absolutely delicious. It’s a great source of protein for those who have decided to cut meat or animal products from their diet. Falafel is also a great to-go or street food, as it is normally served as so in the Middle East. You can find falafel in restaurants and at food stands around your city, but it’s one of those treasures that are surprisingly easy to make at home! Classic falafel most likely originated in Egypt but it’s a traditional dish of Eastern Mediterranean cuisine. I don’t know who first added beets to their falafel. Ah, beets – one of the best-acquired tastes in the world. They say it takes a certain type of person to enjoy the taste of beets. Most people give you a sour look when you say you love them. I don’t like them plain, but cooked, then sliced or grated and seasoned with lots of black pepper, garlic, and drizzled with oil and vinegar IS THE BEST! I grew up eating this red beet salad and my older granddaughter Ava eats them by the fistful too. I’m sure you have heard of the Halal Guys in New York City. Well if you haven’t, the Halal Guys is a famous food truck that serves up gyros, platters, hummus, and falafel. As I said before, falafel is traditionally an on-the-go or street food, and their falafel is to die for! Not to be dramatic. It’s trendy to walk around New York City with some falafel in your hand. 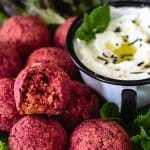 HOW TO MAKE RED BEET FALAFEL? Well, if you’re not in New York, you can easily make falafel at home. All you need is a food processor, red beets, and chickpeas. It’s almost really that simple. You’ll want some seasonings in there as well, of course! And if you don’t have a food processor, you’re missing out on a world of possibilities in the kitchen. A food processor is definitely on my list of must-have kitchen appliances (check out the products section below). 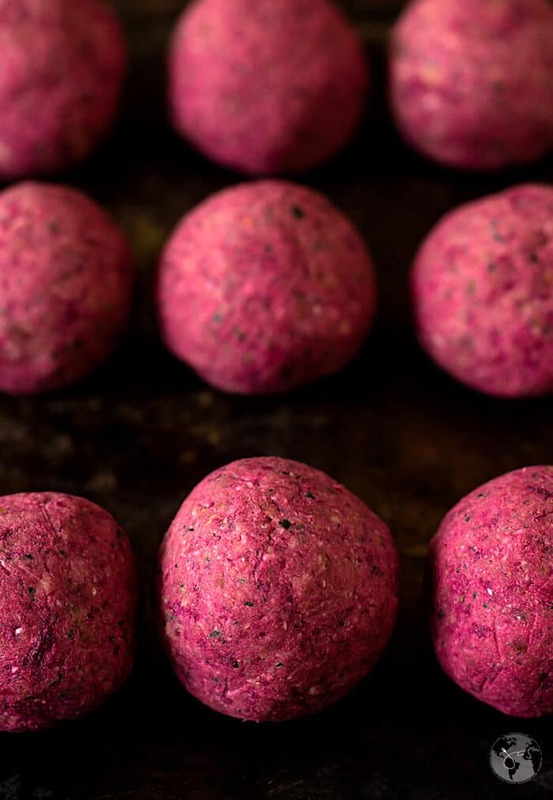 MAKE RED BEET FALAFEL – Drain the chickpeas, peel and dice the beets and add to a food processor. Add shallot, garlic, cashews, and pistachios, and pulse until a crumbly mixture forms. Add eggs, and season the mixture with cumin, ground coriander, salt, and pepper; pulse to puree. Roll small balls out of the mass with moistened hands and place on a baking sheet. Bake on 350F for about 20 minutes. MAKE YOGURT MINT SAUCE – drizzle yogurt with olive oil, add chopped mint, then sprinkle with ground coriander and black sesame seeds. CAN YOU USE CANNED CHICKPEAS TO MAKE FALAFEL? Falafel police will tell you to only use raw dried chickpeas that are soaked overnight for optimal results because canned is too moist and falafel won’t keep their shape. However, I like shortcuts and I’ve tested this recipe for you a few times until I found just the right combination and amount of ingredients that works. I’M VEGAN, WHAT ARE EGG SUBSTITUTES FOR BINDING? · Aquafaba – Liquid from chickpeas/garbanzo beans. Use 3 tablespoons of this starchy bean water to replace each egg. If you’re using it as a binder, whip it slightly until foamy. Any residual bean flavor will disappear once it’s cooked, so it can be used for sweet or savory recipes. · Flax egg – For each egg, mix together 1 tablespoon ground flax seed with 3 tablespoons warm water. Let the mixture stand for a few minutes to thicken before using. If it isn’t thickening, you can heat it until it does so, and then cool and add to your recipe. If you are using it in baking recipes that need to rise, add 1/4 teaspoon extra baking powder to provide the leavening needed. I highly recommend serving falafel with yogurt mint sauce, or some tahini sauce or with a little bit of smooth hummus. You can dip them right in and eat them like nuggets, place them over mix greens, or put them in a pita for a whole meal. Whichever way you choose to enjoy, you will absolutely love the bright flavors of the beets in there – I promise! An accidental smiley face in the yogurt, ha! HOW TO STORE LEFTOVER FALAFEL? In case you have any leftovers (we never do), the best way is to keep them refrigerated. 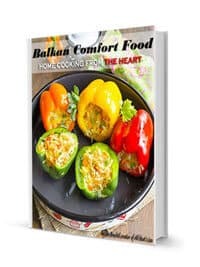 You can reheat them in the oven or microwave, but they are also good at room temperature or cold. Store both unused falafel mix and cooked falafel in the refrigerator, covered, for up to four days. Use paper towels to pat dry chickpeas and remove as much moisture as you can. Your falafel will be crispy from the outside and soft but not mushy on the inside. Wear rubber or disposable gloves when handling the beets. They will stain your hands! If that happens, rub your hands with fresh-squeezed lemon juice over your sink. Rinse and repeat. You can also try rubbing your hands with a teaspoon of salt. Rinse your hands with warm water to remove the salt and stains. You can add chopped fresh parsley and cilantro to the falafel mixture. Herb tender stems hide the most flavor, so make sure to include them too. If you like spicy food, add some red pepper flakes to the falafel mixture. 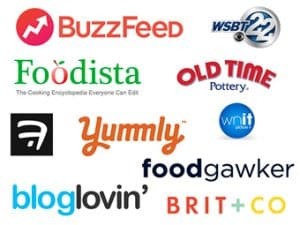 These are all affiliate links for Amazon but you can find them at a store too. If you buy anything through one of these links, I earn a small commission that helps me keep these pages up at no extra cost for you. Click here to read my full disclosure policy. Some foods stain, like red beets and turmeric. Wearing gloves will save you a headache of trying to remove stubborn stains from your hands. I love the tight fitting disposable gloves and use them to handle raw meat, chop onions or garlic and other household chores. 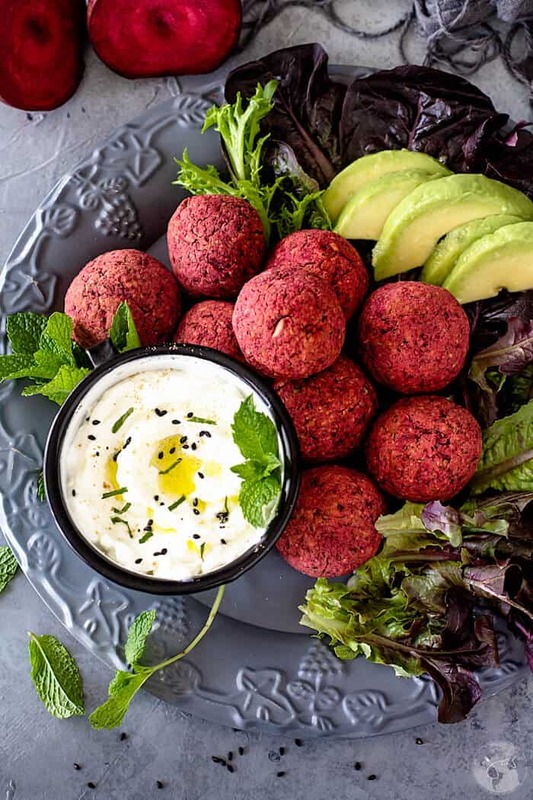 This beautiful red beet falafel is oven-baked and served with yogurt mint sauce for dipping. Preheat oven to 350 degrees Fahrenheit. Line a large baking pan with parchment paper. Set aside. In a food processor, combine the chickpeas, beets, shallot, garlic, cashews, and pistachios until a crumbly mixture forms. Add eggs and season the mixture with cumin, coriander, and salt and pepper to taste. Pulse the mixture to puree. With your moistened hands roll small balls out of the mixture and place on prepared baking pan. Bake for 20-30 minutes or until firm on the edges. Meanwhile, make the sauce. Spoon the yogurt into a small bowl and spoon with olive oil. Add chopped mint and sprinkle with coriander and black sesame seeds. Serve as a dip alongside the falafel. Enjoy! Aquafaba - Liquid from chickpeas/garbanzo beans. Use 3 tablespoons of this starchy bean water to replace each egg. If you’re using it as a binder, whip it slightly until foamy. Any residual bean flavor will disappear once it’s cooked, so it can be used for sweet or savory recipes. Flax egg - For each egg, mix together 1 tablespoon ground flax seed with 3 tablespoons warm water. Let the mixture stand for a few minutes to thicken before using. If it isn’t thickening, you can heat it until it does so, and then cool and add to your recipe. If you are using it in baking recipes that need to rise, add 1/4 teaspoon extra baking powder to provide the leavening needed. When you try a recipe, please use the hashtag #all_thats_jas on INSTAGRAM for a chance to be featured in our stories! We’re very familiar with falafels over this way. We have no less than eight falafel stands in our small town. I recently tried a beet falafel, but it was deep fried as most falafels here are and I can’t say as I enjoyed it. Also, it wasn’t nearly as pretty as yours. 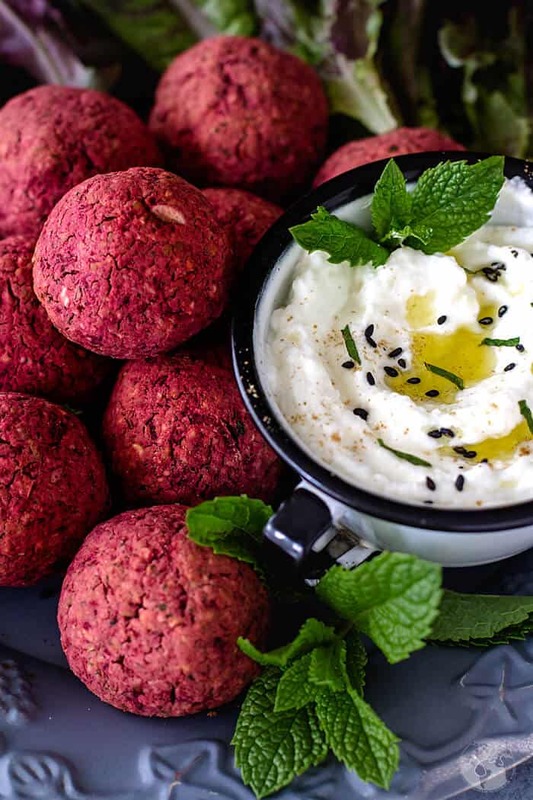 We love beets and often make oven baked falafels so I’m excited to give you red beauties a go. Fantastic colors. Thank you for your kind words, Ron! This was my first time making falafel and trying them with beets. I liked them, so I hope you will too. We can only get the classic falafel at our selected few local restaurants. Jas what a great idea to add beetroot… thanks for sharing at Fiesta Friday. These look so pretty, Jas. I love falafels, but haven’t tried anything with beets. 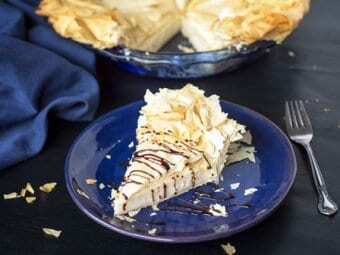 This is such an amazing recipe. Thank you for sharing at Fiesta Friday party. 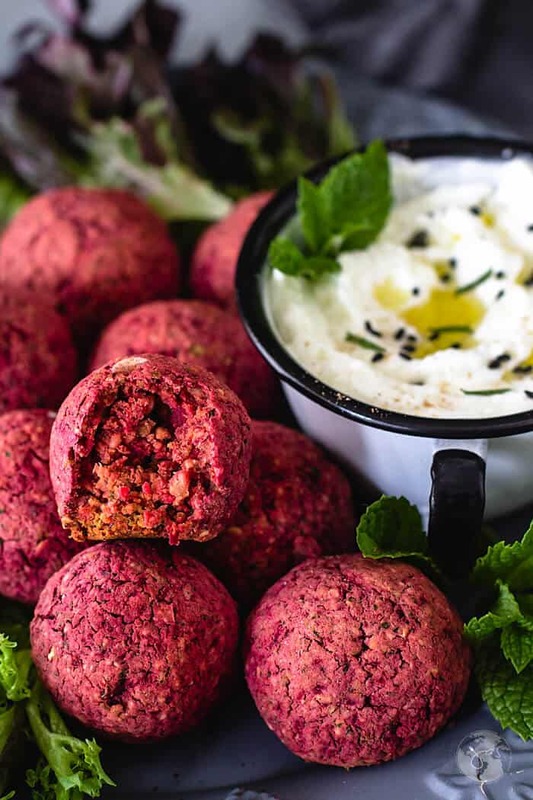 We love beets and falafel so this sound like a fun one to try. And it looks so pretty! Thanks for sharing this at the Craftastic Monday Link Party @ Sew Can Do. This looks really really good. Is there a way to bind this without the eggs as I seldom have eggs around. Beets are definitely an acquired taste. They’re not too strong in this recipe, so I dare to say it’s safe to try it. 🙂 Thanks, Kari! Thank you so much, Christina! I’m really happy that you like it. Hugs!